As the winter holidays approach, there’s a distinct increase in sappy, family-centric commercials and movies on TV — and in the air in general. It makes sense, as this is one of the most popular times of year for families to come together to celebrate, or simply to enjoy time together. 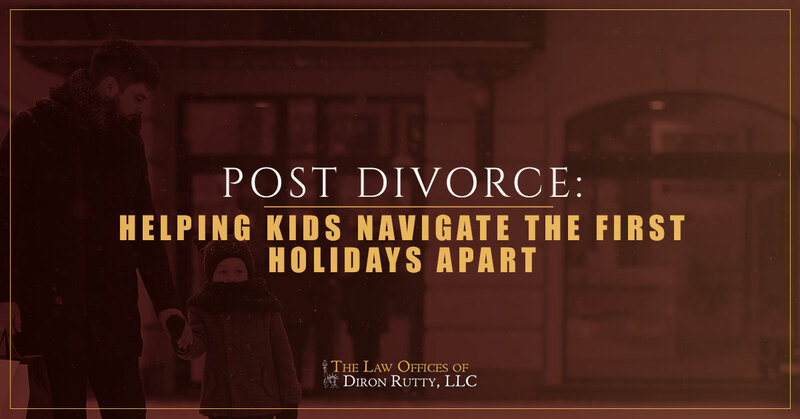 However, if your family has recently experienced major changes through separation or divorce, the holidays can be an especially trying time of year. For kids, it can mean missing out on fun family traditions from years past as they swap between households. Or, it may mean missing time with one side of the family entirely. It can be a lot for kids to handle. Whether this is the first holiday season apart or not, try these tips to help your children navigate the holidays after a divorce or separation. One of the hardest things on any kid at any point during a divorce is not knowing what’s going on. This goes double during the holidays. If your kids don’t know where they’ll be, what’s going to happen, and what the holiday festivities will look like, they’re more likely to act out and struggle to cope with the changes to their lives. Make sure you adhere to any legally-set custody decisions and work with your ex-partner to create a firm holiday schedule in advance. This way, you can clearly tell your kids where they’ll be for all of the big moments of the holidays. If your kids are older, including them in the decision-making process can make them feel more in control and make it easier to handle the changes. Once you and your ex-partner have a plan in place, communicate it clearly to your kids and set expectations early so they have time to adjust to the changes. As the holidays approach, keep clearly communicating everything with your kids to minimize their stress. There are few things as magical as seeing the holiday excitement through a child’s eyes. It can be really tempting to want to keep your kids all for yourself during the holidays so you can hold onto that magic. But remember that your children are individuals, not possessions. If you have a custody agreement that splits holiday time with your ex-partner, make sure you keep it as equitable as possible. Children adjust better to divorce as a whole when their parents cooperate with each other and keep conflict to a minimum. Along the same lines, avoid making your child play the messenger between you and your ex-partner. If you can’t keep it civil, it can be better for your kids if you work with a family lawyer to communicate and negotiate schedules, rather than trying to use your kids to keep the peace. The winter holidays are a big time for family, which means your kids will likely want to see both sides of their divided family. A good general rule throughout divorce proceedings, not just after, is to keep it civil and avoid bad-mouthing your ex-partner. Continue with that respectful, polite behavior, not just about your ex-partner, but about their family as well. Remember, just because you aren’t married any more, your ex-partner’s family are still your children’s family. Don’t bad-mouth them and try to keep it polite as you meet up to transfer your kids to and from celebrations. It can be tempting to cling to all the traditions your family had before the divorce. While that’s not necessarily a bad thing, sticking too rigidly to those old traditions can highlight all the differences between life now and life before the divorce. To your kids, it might feel like salt rubbed in a wound rather than an enjoyable celebration. For kids that are old enough to remember and make their opinions known, include them in the decision process. Talk about ways you’ve celebrated in years past and ask whether they want to do that again. This is also a great time to introduce ideas for new traditions. Whatever you choose, remember that communication is the key for creating good memories, rather than strife. When you have younger kids especially, it can be simple to pour all of the focus on their holiday joy — and forget your own. The holidays are going to be different for you, too, so remember to take some “me time” and make sure you’re celebrating the holidays in a way that makes you happy. If your kids will be with your ex-partner during the holidays, take some time to do something fun with friends or a new partner. Even little things like decorating the house or making a nicer-than-normal meal can be positive ways to help you embrace the changes in your life, rather than stew on the changes. When you’re happier and more relaxed, you’ll be better poised to spread that holiday happiness to your kids, as well. The biggest thing to remember during the holidays — and always — is that you and your ex-partner need to keep arguments to a minimum and communicate clearly about your kids’ schedules. No matter where you are in the divorce proceedings, a family law attorney can help you both keep things civil. Connect with the Law Offices of Diron Rutty, LLC to meet with a family lawyer for help with separation, divorce, and child custody concerns in the Bronx and across New York City.